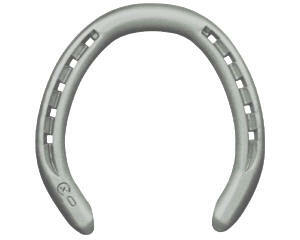 The TDR is a steel half-round trotter shoe, with or without clip. The advantage of this is that the front legs can make place for the fast moving hind legs. The crease of the TDR gives you traction that is not available with a typical plain stamped half-round. In addition to this, there are no sharp edges, which prevents damage to the legs. The available different dimensions make it possible to experiment with the balance of the horse. Advised nails: E or JC. Founded in The Netherlands in 1916 and managed by four generations of the Kerckhaert family; the company has always maintained its lead in setting trends for others to follow. The first major change came when the motor vehicle redefined the horse as a sports and recreational animal instead of a primary means of transportation. Kerckhaert was first to respond to this change by extending its range of products to suit the needs of the sports enthusiast. Today, with more than 900 different styles in the Kerckhaert product range, and with new horseshoes being continuously introduced, Kerckhaert remains a leader in the field.